The screenshot above is hosted and provided by aiseesoft.com. Please contact them directly for any copyright infringement as we are not responsible for that content. Last Update: 2018-12-25 - Major Update: 1. Support copy Contacts, Photos and Media to Android. 2. Newly support iOS 12. 3. Fixed some other issues. Requirements: 1 GHz Intel or AMD CPU, or above; 1G RAM or more. Limitations: 30 Trial / 30-days trial. With the trial version, you can copy 30 contacts, 100 photos and 100 media at most. FoneCopy can copy your iPhone Music, Movies, Photos, Contacts and more other files to the other Apple device. It can detect more than 2 devices simultaneously. Don't be afraid of losing data if your iPhone is dead or broken, FoneCopy can sync the files on your iPhone/iPad/iPod to another one with fast speed. It also allows users copy file from Android devices to iOS devices. It can supports devices such as iPhone XS/ XS Max/XR/ X/ 8/7/6S, etc, iPad mini 3, iPad Air 2, iPod touch 5 and so on.Moreover, it compatible with the new iTunes 12.3. With this free powerful software, you can copy your iPhone files to another device such as iPhone 7 or iPad Air. This FoneCopy software makes it possible to backup Text content(3 types) and Media content(13 types) from one Phone to another, even from the dead or broken one. Do you want to copy files from your Android device to the new iPhone? 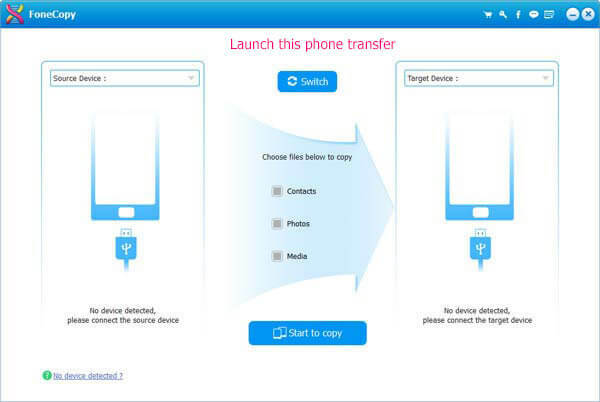 Fonecopy can help you transfer your important data from your Android devices to your new iPhone/iPad/iPod with no loss. As for the Text content, it allows you transfer ePub, PDF, Contacts. As for the Media content, you can copy Music, Movies, TV Shows, Music Videos, Podcasts, iTunes U, Ringtones, Audio Books, Voice Memos, Photos, Camera Shot, Playlists, Albums. For more secure data transmission, it provides two modes(transfer files to another device directly or transfer files after erasing the data on the target device) to transfer files. You can choose any one according to your need. It is able to supports all Apple devices such as iPhone XS/XS Max/XR/X/6s/6s Plus/6/5, iPad Air 2/mini 3/2, iPad Pro, iPod Touch 5, iPod Nano 7, etc. Android devices including Samsung GALAXY Note5/4/3, Samsung GALAXY S5/S4, HTC One (M8), HTC One (E8) and Xperia Z3, etc.